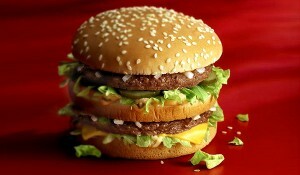 Has the Big Mac become much smaller over the years or have the Big Mac lover’s grown bigger? The name suggests monstrosity. Mac is a name normally given to a husky, muscle bound Mac, there you see the name just pops out when you want to describe a Mac, Ooops…there it goes again. OK, Mac is BIG. Then there’s that word “Big” which refers to Mac who is already big. The point is that the actual Big Mac burger seems to be a letdown from the name and from the giant double cheeseburger on the display. One can argue that it’s because Americans are big eaters and it can’t be just all about us. The rest of the world would still consider the Big Mac as a Big Mac. On the contrary, the McDonald’s Big Mac has been such a disappointment, size-wise, that people around the globe have already taken it upon themselves to cover up for the lacking size. McDonald’s Singapore sells the Big Mac which is the same as what we have here but aside from this, they also have the Mega Mac which is a top seller. Mega Mac is bread, burger patty, cheese, burger patty, cheese, veggies then, the middle bread, burger patty, cheese, burger patty cheese, veggies and finally the top bread. You don’t have to go far. The McDonald’s at the Singapore Airport is popular and always full packed. Most of the customers are eating Mega Macs. And, these are not huge Americans we are talking about. Most are just regular sized Caucasians and Asians easily handling the mega version of the Big Mac. McDonald’s is also very popular in New Zealand. It’s very much emphasized in the Big Mac box that all the ingredients come from New Zealand with a map that shows you exactly where the meat, cheese and veggies came from locally. Kiwis don’t order the regular Big Mac Meal. What they’ll order is the Double Big Mac which is two Big Macs with a bottomless drink and large fries. One reason that can be stated in defense of the Big Mac is that much talk about fast food being unhealthy and all that stuff but hey, we are talking about the Big Mac here. McDonald’s can give the health conscious their version of a Diet Mac or something but not at the expense of the over indulging Big Mac fans around the globe. Admit it or not, the Big Mac burger patty has lost some of its consistency compared to what they were serving back in the 80s. In the 80s, there was less dressing needed because the patties were so potent as it dictated the taste. The cheese was as juicy before but it lacked the attention it deserved. The best cheese in the world was ignored simply because the meat was overwhelming. Today’s version of the Big Mac, whether it’s here, in New Zealand or in Singapore, is less of a burger than it was in the 80s. There is more dressing, probably to cover up to what’s missing in the meat. And the cheese has become more prominent. The Big Mac’s only merit lies on the taste of its cheese. As previously stated, the McDonald’s cheese hasn’t changed much but it has drawn so much attention because of what the Big Mac meat is missing. It could be the price. Cost of meat, cheese and everything else in the Big Mac has become more expensive to acquire so, as the cost of goods sold goes up, so must the selling price. Don’t worry, that has been applied not only here but all over. Some countries have had it worse with the present cost of their Big Mac 10 times more expensive than the better version in the 80s. We don’t want to think of the worst but we can raise some serious questions. With the increase in the price of the Big Mac covering the rising cost of its ingredients, could it be that the profit margin should also increase and that will be taken from putting in less of what the Big Mac had before? Could the sales strategy be that by making the Big Mac less filling, it would increase sales volume because people will have to buy more to gain the same satisfaction that they have been used to? These are two questions that are worth considering. Remember, the decision makers at McDonald’s may not be the same ones who were eating Big Macs before. They might be working things out at the McDonalds’s conference room to decide on what’s best for business while eating food from some other restaurants. What the Big Mac lacks is what the other burger resto’s are capitalizing on. Come on guys; let’s go back to what the Big Mac is all about. With the right Big Mac, the other giant burger novelty restaurants should never be in the ball game at all.